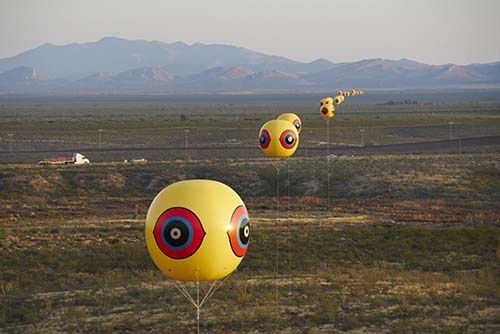 SCOTTSDALE – Scottsdale Museum of Contemporary Art (SMoCA) will present the Arizona premiere of Through the Repellent Fence: A Land Art Film about the Southwest-based, interdisciplinary arts collective Postcommodity. The film follows the collective, comprised of three Native American artists – Raven Chacon, Cristóbal Martínez and Kade L. Twist – as they conceive their historic, two-mile-long installation that straddled the border between Douglas, Ariz., and Agua Prieta, Sonora, Mexico. – Saturday, April 22, 2017, 5 p.m.
After the film, director Sam Wainwright Douglas, along with Martinez and Twist, will engage the audience in a discussion. Tickets are $7 for the general public and $4 for members, and are available through http://smoca.org/event/ or 480-499-8587. Postcommodity’s goal in making the film was to give voice to the shared history and enduring cultures of indigenous societies that called the region home long before a border divided them. With support from communities on both sides of the border, the artists installed 28 large-scale inflatable spheres emblazoned with an insignia known as the “open eye” that has existed in indigenous cultures from South America to Canada for thousands of years. Through the Repellent Fence provides an intimate glimpse into the arduous process behind creating this ambitious artwork and how land art can bring communities together. The film had its world premiere this past February at The Museum of Modern Art in New York City, and has received critical acclaim at notable film festivals. “The behind-the-scenes efforts of the trio of Native American artists intending to make a (hopefully) lasting testimonial is … a visually rewarding account … The film serves as a whimsical, beckoning endorsement of diversity and inclusion,” The Hollywood Reporter noted in a review of the film earlier this month at South by Southwest (SXSW) in Austin, Texas. Founded in 2007, Postcommodity has exhibited nationally and internationally, and is currently showcased in the 2017 Whitney Biennial in New York. The collective was featured in a 2015 SMoCA exhibition as part of the Museum’s ongoing southwestNET series.